I can never resist the dubious allure of freaky food models. Self-saucing hot dogs, I-scream cones, hungry heifers, daffy doughnuts and cannibalistic coffee beans have all appeared on this blog - and in my nightmares! 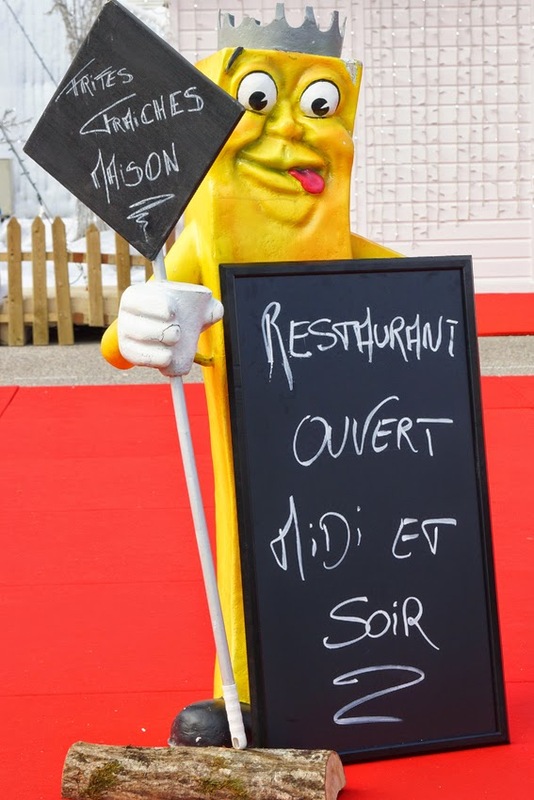 Usually, they're found at the seaside, so this fearsome French fry took me by surprise: he was scaring attracting customers at a Christmas market in La Defense, Paris. One of London's newer, and most extraordinary, art galleries deserves a visit as much for its building as for its exhibitions. 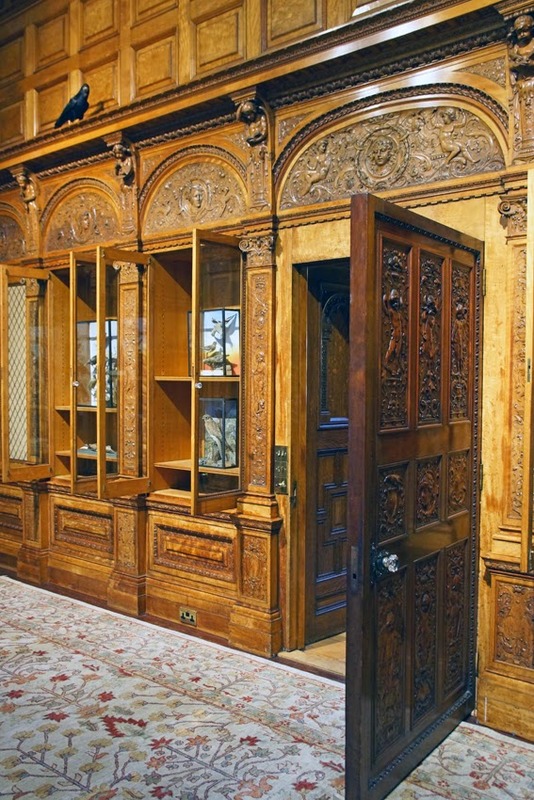 With a mission to showcase collections from around the UK, Two Temple Place offers its annual winter exhibition free of charge. The current show is Cotton to Gold: Extraordinary Collections of the Industrial North West and brings together a huge range of items (mediaeval books of hours, taxidermy, Roman coins, Japanese prints, Turner watercolours, Tiffany glass, and more) collected by philanthropical industrialists and later donated to public museums and galleries including Blackburn Museum, Haworth Art Gallery, and Towneley Hall. 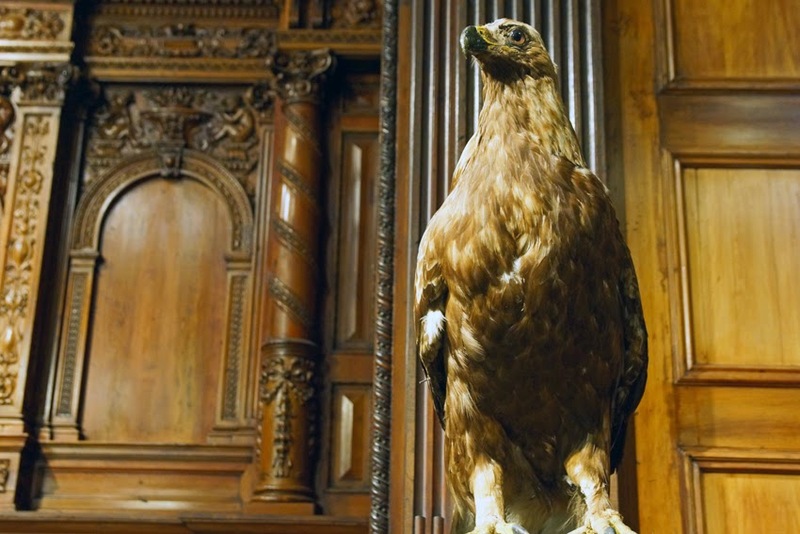 The diverse collections fit beautifully into this late-Victorian house, and the curators have cleverly placed them in ways which complement each other. Some of the taxidermy in particular looks very much at home in its temporary surroundings! The architecture deserves as much as attention as the exhibits. 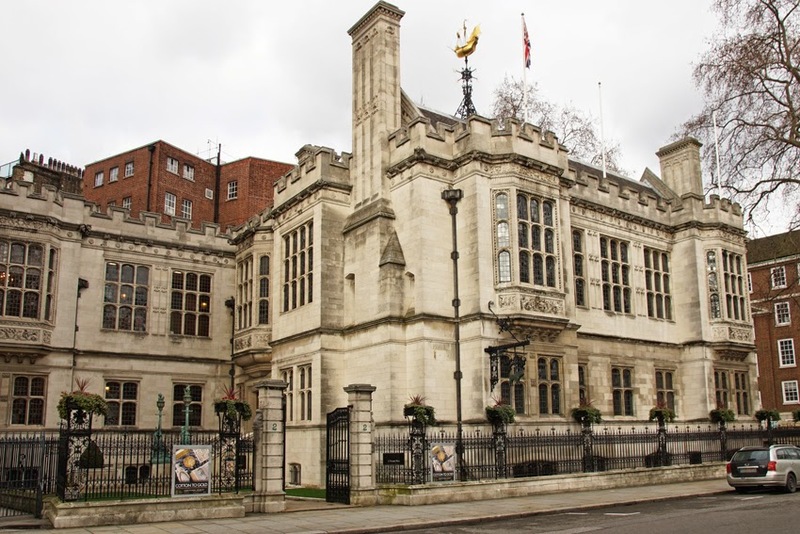 Two Temple Place was built as the estate office and London home of William Waldorf Astor, the wealthy American who also remodelled Cliveden and Hever Castle. Astor had lived in Europe as a young man, and in 1882 returned to Italy for three years as a diplomat. He became the richest man in the world after his father's death in 1890 and, disenchanted with various aspects of life in New York, he chose to leave the United States for England. He invested in the press, buying the Pall Mall Gazette, and took up writing himself; he also bought Cliveden and took out a lease on the grand Carlton House Terrace in London. 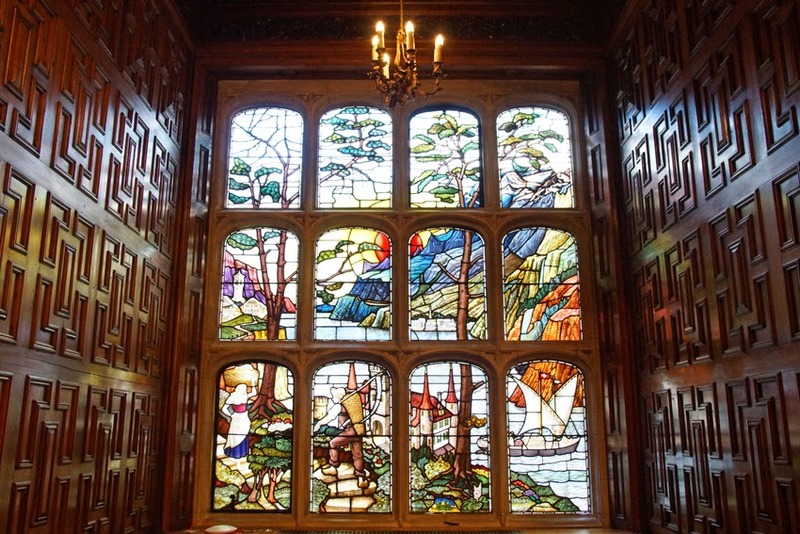 It was an extravagance, then, to commission Two Temple Place as combined home and office for the Astor Estate in New York. Even more extravagantly, Astor gave his architect a free hand with the budget. The building's cost was apparently £250,000. John Loughborough Pearson, the architect, was best known for his Gothic Revival churches, but also drew upon other influences including Renaissance and Byzantine architecture. In building this Elizabethan-influenced house, he paid great attention to the decorations and fittings as well as the fabric of the building itself, creating what Pevsner described as 'a perfect gem'. 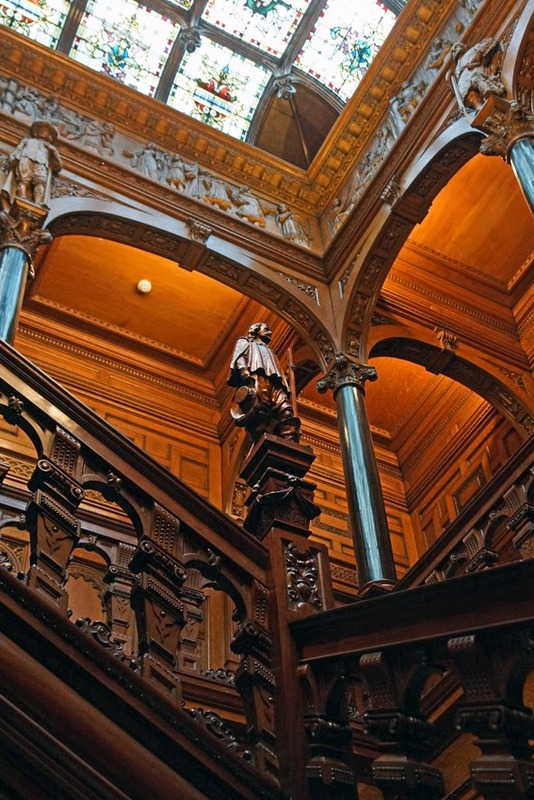 The most attention-grabbing part of the interior is the grand staircase, rich in wood carving and topped with a large stained-glass skylight. 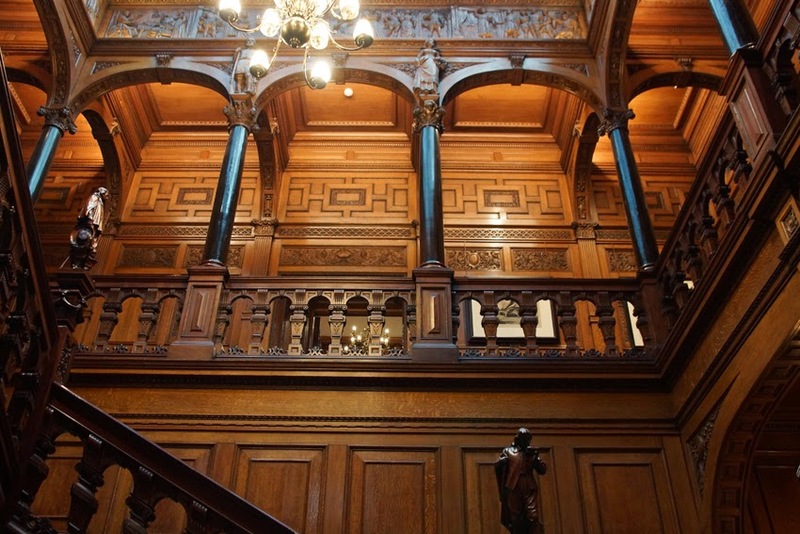 Visitors are not disappointed when they complete their ascent: among the first-floor rooms is the Great Room, wood-panelled, with a hammer-beam roof and two striking Clayton and Bell stained-glass windows. Its main doorway has nine silver-gilt relief figures of Arthurian heroines, the work of George Frampton. The exterior is equally rich in detail and decoration. Portland stone and mullioned windows create light but impressive facades; the large weather vane, elaborate ironwork and highly decorative lamps add to the luxurious effect. 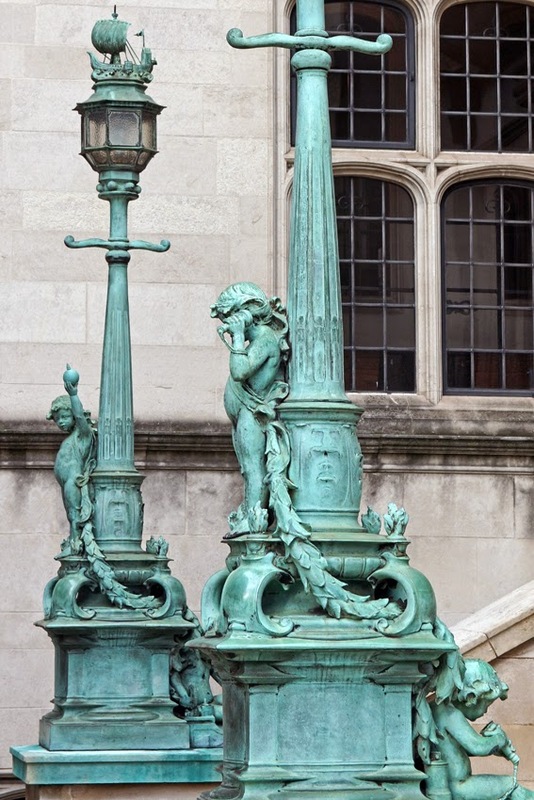 The pair of bronze lamps was sculpted by William Silver Frith and contains references to the building's role as a modern estate office. Two of the putti are conversing on the telephone; the other lamp has one putto holding a light bulb (rather different in shape in the 1890s to today's versions) while the other has electrical eequipment. 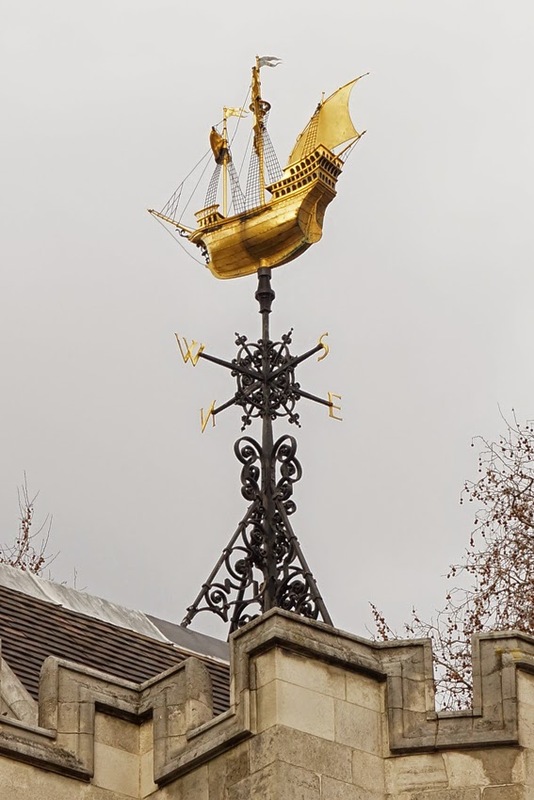 The weather vane represents Columbus' ship the Santa Maria, a reference to Astor's family history and connections between the United States and Europe. Astor's wife died while Two Temple Place was being built, and it would be his retreat as he became increasingly reclusive. After his death, Astor's sons put the house up for sale and in 1922 it was bought by Sun Life Assurance. Six years later they sold it to the Society of Incorporated Accountants, who remained there until 1959; during their tenure, the building suffered much damage from a V1 flying bomb. Restored, it would be Grade II* listed shortly before being sold again in 1959, to Smith & Nephew. Finally, in 1999, it was acquired by its present owners the Bulldog Trust. A bulldog sign now hangs jauntily outside, welcoming visitors to the varied treasures within. The current exhibition, Cotton to Gold, runs until 19 April 2015. It is open daily except Tuesdays; entrance is free, and there is a cafe and shop. 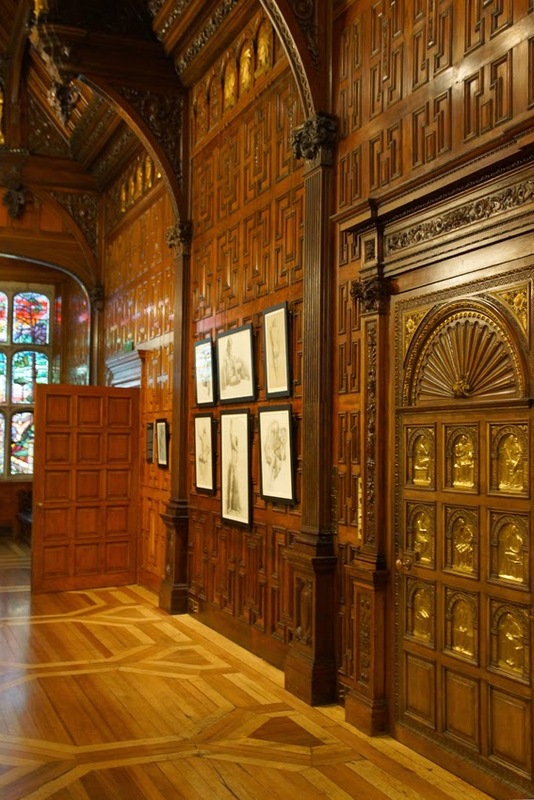 For more information about the building, there is an excellent and beautifully-illustrated book by Barbara Bryant, Two Temple Place, on sale in the gallery shop. 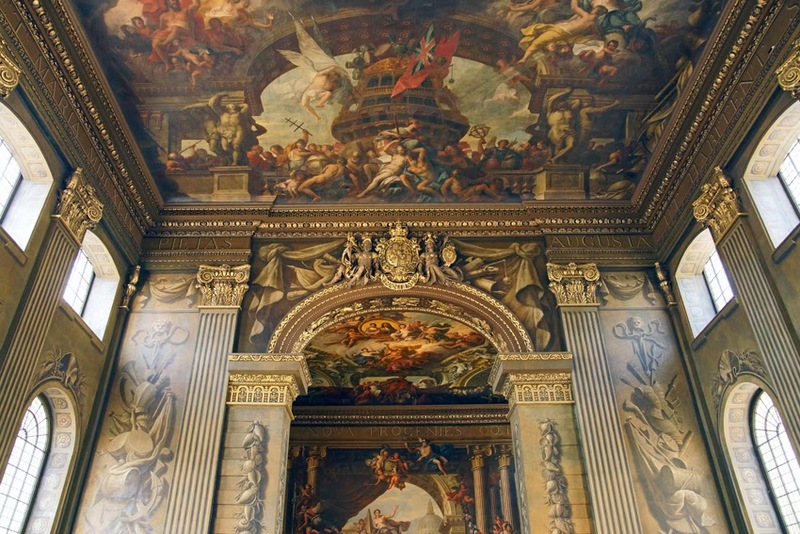 The Painted Hall of the Old Royal Naval College, Greenwich must be one of Britain's grandest dining rooms - and is certainly one of its greatest Baroque masterpieces. Once completed, it was deemed too good for the retired sailors it had been intended for; instead, it has been used for formal events such as the lying in state of Admiral Lord Nelson's body. 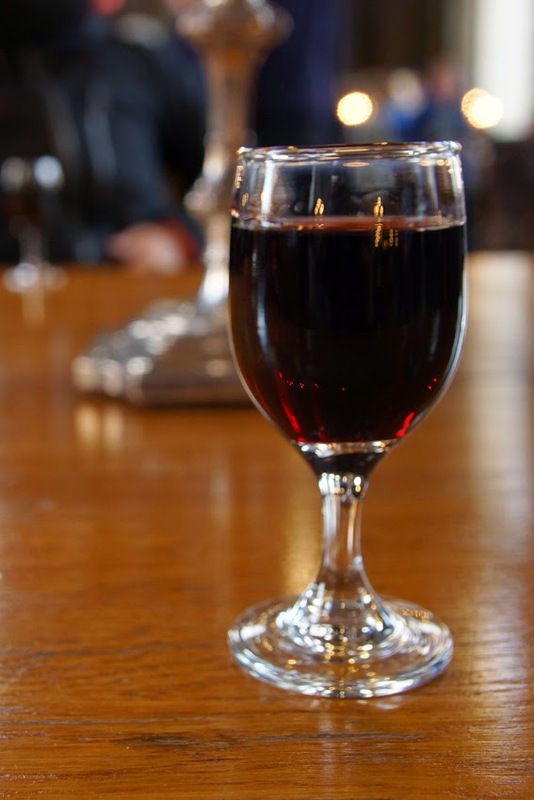 Every year, the toast to his immortal memory is still drunk here. I explored the hall during conservation of the West wall, and was able to get up close to the work. Now it's the turn of the Lower Hall - the main area, currently looking a little faded by comparison - and a condition survey has just been completed. 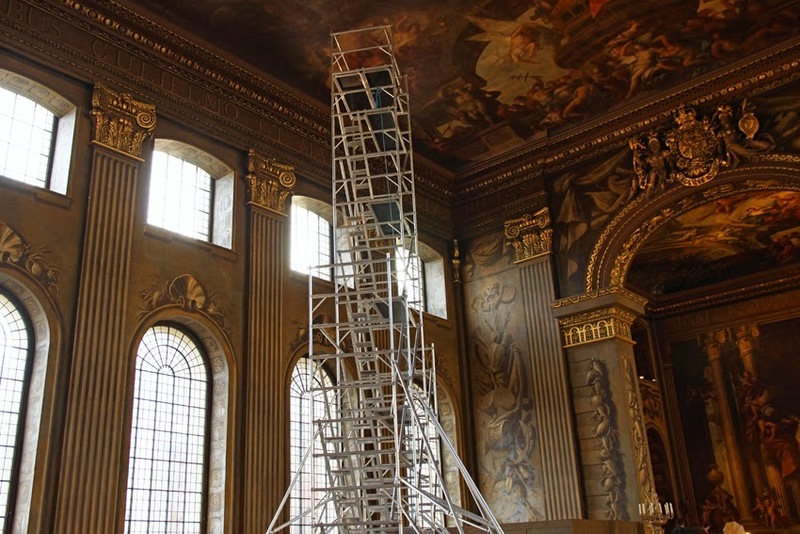 It involved use of a scaffold in the hall, and a cherrypicker crane to examine the heights of the vestibule's cupola. One happy finding is that the structure of the ceiling is sound. Wren's favourite plasterer, Henry Doogood, did such a fine job that the plaster is still in immaculate condition today. There are just some minor cracks from movement of the timber joists. Unfortunately, there are more problems in the hall than were found in the west wall area - and the main villain is the light which pours through the large windows. 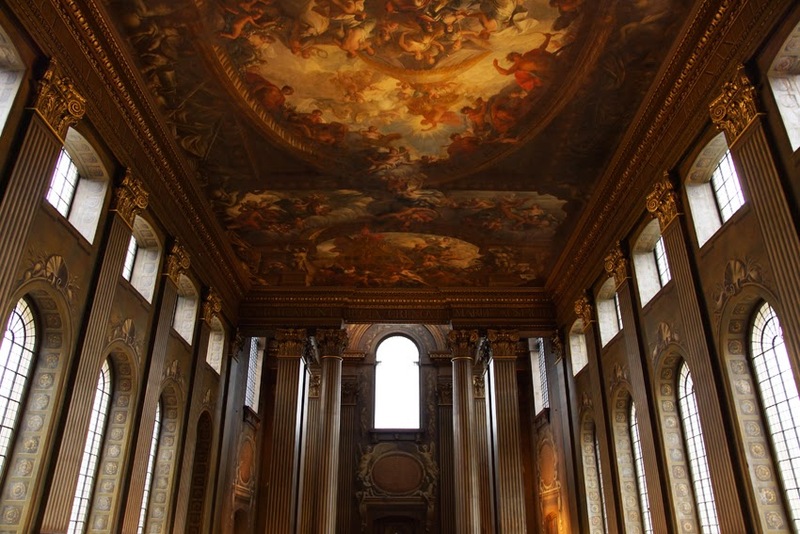 They add much to the ambience of the room, and offer wonderful views of Wren's buildings, but also expose the painting to damaging levels of sunlight. When the work is completed, a key challenge for the conservators will be minimising future damage without plunging the hall into gloom. They are already considering possible solutions such as mesh blinds with UV filters. Light isn't the only culprit, however. 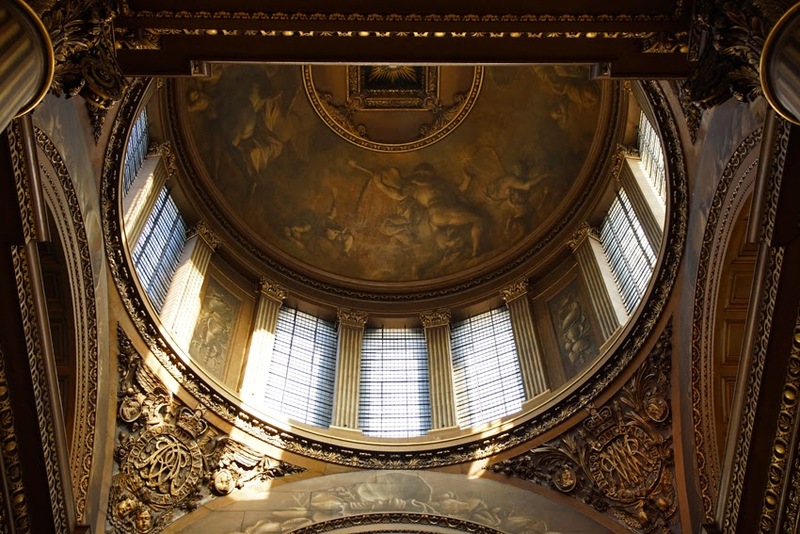 Since Sir James Thornhill completed the paintings in 1727, there have been a number of restorations, some better than others. The last major restoration, by the Ministry of Works in the 1950s, removed about 15 layers of darkened varnishes! In particular, at least one restoration used a pine resin varnish which is proving incredibly difficult to remove. Although more durable than solvent-based varnishes, it has now fractured, resulting in 'blanching' where the damaged surface appears whitened. The 1950s restoration, co-ordinated by the magnificently-named Westby Percival-Prescott, used a dizzying selection of powerful chemicals but couldn't get rid of all of the varnish, and it was left intact in darker areas in particular. A further problem is the environment. Not only does this large space have uneven temperatures and humidity, but the main doors let in regular gusts of outside air. Along with the restoration, there will be changes to public access so that visitors enter through the lower King William Undercroft. Combined with a new heating system, this should provide a more comfortable and controlled environment for the paintings. One of the joys of the first stage of the project was that thousands of members of the public could tour the work and get really close to the west wall paintings. That initiative will be repeated in the Lower Hall while work takes place from 2016. 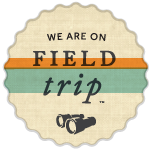 The project has funding from various grants, but needs to raise more money. While Thornhill was paid £3 per square yard for the ceiling (and just £1 per square yard for the walls), conservation is likely to cost £675 for the same area. Even allowing for inflation, that's more than double the cost! If you'd like to support the work, you can donate here or become an ORNC Angel.